Hayden Trenholm, the policy advisor for N.W.T. Senator Nick Sibbeston, says he felt like he was watching a movie when he heard four shots fired while he was near the National War Memorial Wednesday morning, and then saw a "soldier on the ground, not moving." An eyewitness to Wednesday's shooting of Cpl. Nathan Cirillo, who was killed while standing guard at the National War Memorial and the Tomb of the Unknown Soldier, says he heard the shooter yell 'for Iraq'. Hayden Trenholm, a policy advisor for N.W.T. Senator Nick Sibbeston, says he was on the plaza at the war memorial when he heard the first shot. "It was very loud," Trenholm said, adding that he was about 12 metres away from the shooter. "I actually thought, when I first heard it, that it was some sort of ceremonial event." Trenholm says he then turned towards the area where he heard the shot come from and says he saw a man wearing a scarf with a rifle over his shoulder. Trenholm says in total, he heard four shots go off as he followed one soldier dressed in uniform who was running. "Then I saw the solider [Cpl. Nathan Cirillo] on the ground, not moving." Trenholm says there were about 10 people just standing in the area around the soldier, not moving, no one saying anything. And then he says the man with the rifle — who Trenholm describes as having tanned skin and long, dark hair — pulled down his scarf, held his rifle one-handed over his head and yelled "For Iraq." "It was kind of unreality because he had no expression," Trenholm recalled. "You know, it was not passionate, it was not anger, it was not anything. He just said the words, you know, in a loud voice." Trenholm says the man then ran and got into the driver's seat of a grey car on Wellington Street and drove east. "That was sort of the last I saw." 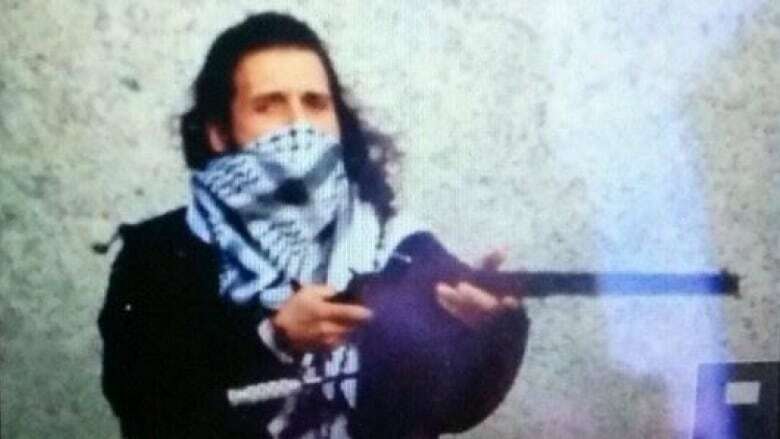 The alleged shooter, Michael Zehaf-Bibeau, 32, who was shot dead inside the main Parliament building, had a long criminal record in Quebec and British Columbia. Wednesday's shooting comes just days after one soldier was injured and another was killed in Quebec by a man who officials say was motivated by Canada's involvement in the fight against ISIS in Iraq. No similar link has been made in this case, though RCMP Commissioner Bob Paulson says Zehaf-Bibeau had "extremist views." Paulson also says Zehaf-Bibeau's email was found in the hard drive of someone RCMP have charged with a terror-related offence. And RCMP also say the shooter's mother told officers Zehaf-Bibeau wanted to travel to Syria. Paulson says the shooter was not one of 90 "high-risk" individuals being investigated by the RCMP, though Paulson says he would have been on the list if RCMP knew he wanted to go to Syria. Hayden Trenholm says he called 911 after he saw Cpl. Nathan Cirillo on the ground at the National War Memorial, and told police what he saw. He says everyone standing in the area where he was "had the same sense of stunned confusion." Trenholm says today, he doesn't feel anger or fear, but simply that he has a duty to go back to Parliament Hill and do his job. "When I think of Cpl. Cirillo, who died being proud and doing his duty, that's the only tribute I can honestly give him, is to do my duty.